Within the SpyParty community I’m known for being from Lithuania (wherever that is), but more so for playing SpyParty a lot, talking a lot, and generally doing everything a lot. And that‘s the kind of person I am–when I love something, it takes up a big part of my thoughts, my emotions, and my life. And that‘s why SpyParty has made me cry more times than some of my crushes. As I write this, I have about 5,000 games played. When I started playing this number was unthinkable, and I assumed anyone who’d played that many games must be a pro. But now that I’ve reached it, I don’t feel like a pro. I still second guess my decisions. I still question my assumptions and doubt my ability to understand things. I still get fooled by AI pathing, and I’m still not sure when a briefcase return is suspicious. I don’t feel as good as my game total. And sometimes, the difference between my experience and my expertise can be discouraging. About a month ago I posted a quick diary of my time at PAX. This morning, I posted a more in-depth essay on the the trip, the game, and the community that makes it all possible. It’s my attempt at explaining, to people outside the community, just what it’s like to be a part of it, and why the game engenders the interest and loyalty it does. I hope you enjoy it. 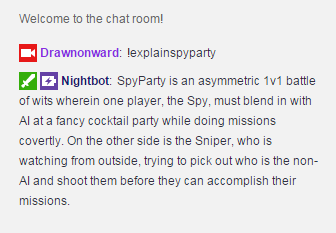 The 2015 SpyParty Summer Cup was completed yesterday evening. It was cast live by myself (warningtrack) and virifaux. You can watch it in two parts via Twitch: part one, part two.